I was wondering if anyone knows if documentation exists for the eighteenth century (in particular the early eighteenth century) on what they would have used at sea to sharpen swords (the munition level kind of swords)? So far, all I can find is that the armorer or gunner would have been responsible for making sure that the ship's collection of swords was sharp and ready for service. Since I am going to own my own early eighteenth century cutlass soon, I want to learn as much as I can about period correct maintenance as possible to go with it, and maybe purchase something to show others what they did at sea to keep a sword good for combat. HI David, I know there are some notes out there for troopers to have been issued files and cloth to maintain an edge. As well there have been notice of a ships smith to be responsible. IN many cases including ships, arms are racked between use and maintained. Other advice to not use swords for holding meats while roasting have also been brought up. The basics of care regarding the French issuance of files and cloth was to maintain a close angle while filing, with the emery cloth to polish the scratches/ blend the edge. I have both sharp and ground down/blunted examples of 18th century swords. The practice to purposefully blunt swords when not campaigning seems to have been a very continental trait that lasted to the 20th century. The basis for that apparently for drill and parade but I have also read German/Prussian swords were supplied sharp by the producers. 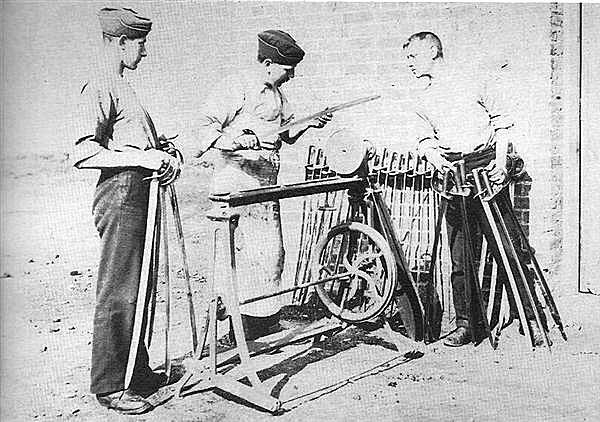 A fellow forumite had offered up a great picture of British during the Boer War era at a grinding bench.wheel. 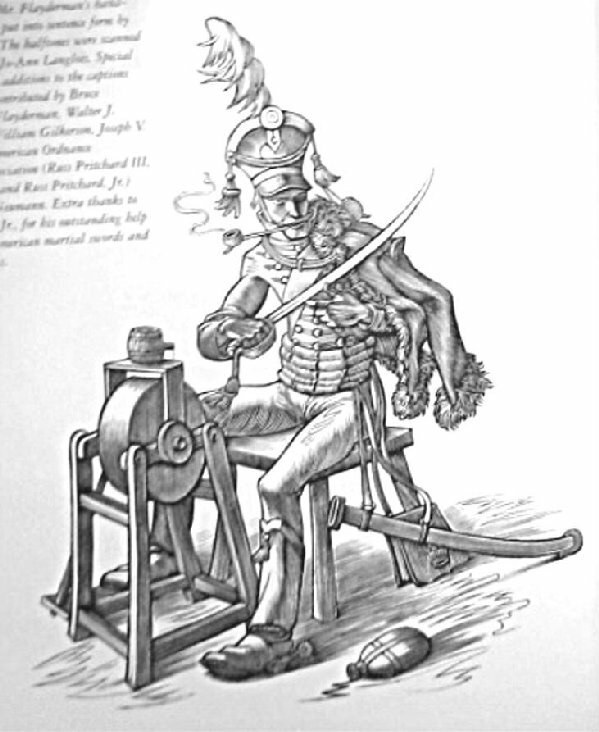 I have also a great almost comical illustration of a hussar at a grinding wheel, while smoking his pipe. Both quite accurate, I would think. The French regulation of a file and cloth was from Jean Binck in one of the Sharpening threads in the Antique&Military section of Sword Forum International.